The online version of this article ( https://doi.org/10.1186/s12966-019-0792-7) contains supplementary material, which is available to authorized users. In total we screened 2200 titles (Fig. 1) and checked 365/1416 titles (initial search). During abstract screening we excluded 675 out of 840 papers; key reasons were that papers were conceptual, interventions were not JITAIs or did not target physical activity. Inter-rater agreement (initial search) during double screening of 20% of abstracts (n = 126) was 91% (115/126). 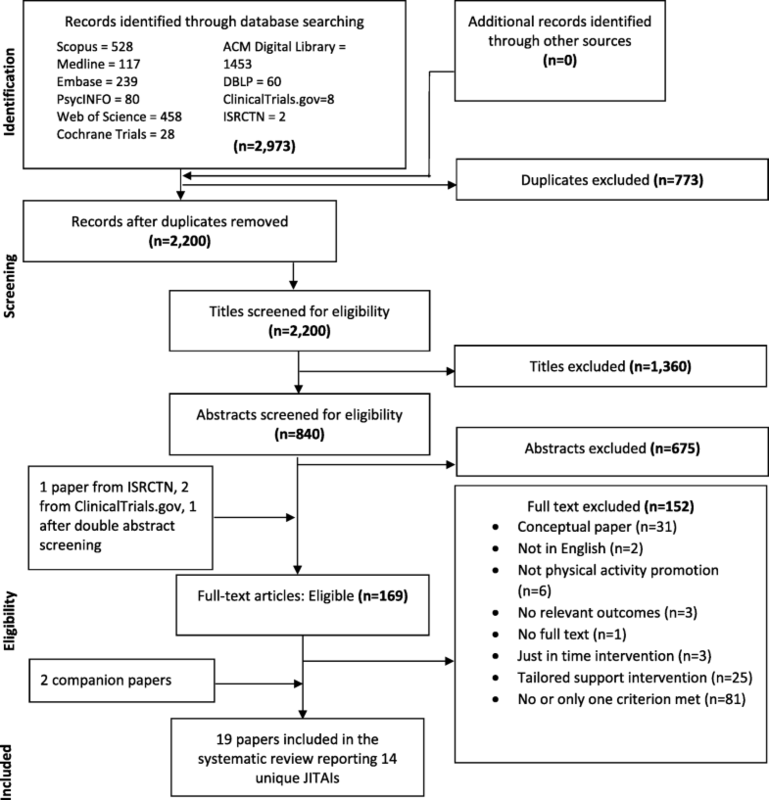 We screened 169 full-text papers: 165 from abstract screening, plus four papers following discussion of discrepancies after abstract screening , a search of the ISRCTN database  and an additional search for RCTs classified as ‘completed’ in ClinicalTrials.gov . We identified three companion papers [19, 20, 21], one through paper screening and two through reading included papers and extracted any additional data. Inter-rater agreement during double screening of 20% of full-text papers (n = 26/132; initial search) was high: 100% for AJ and KL and 92% for JH and WH. The key reason for exclusion at the full-text phase was that the intervention did not include any JITAI feature, or only one. For instance, some interventions only provided real-time feedback on physical activity using text or graphics (e.g., a garden with flowers) [22, 23] or rewarded previous activity , and so were not directly targeting a real time opportunity to be active. 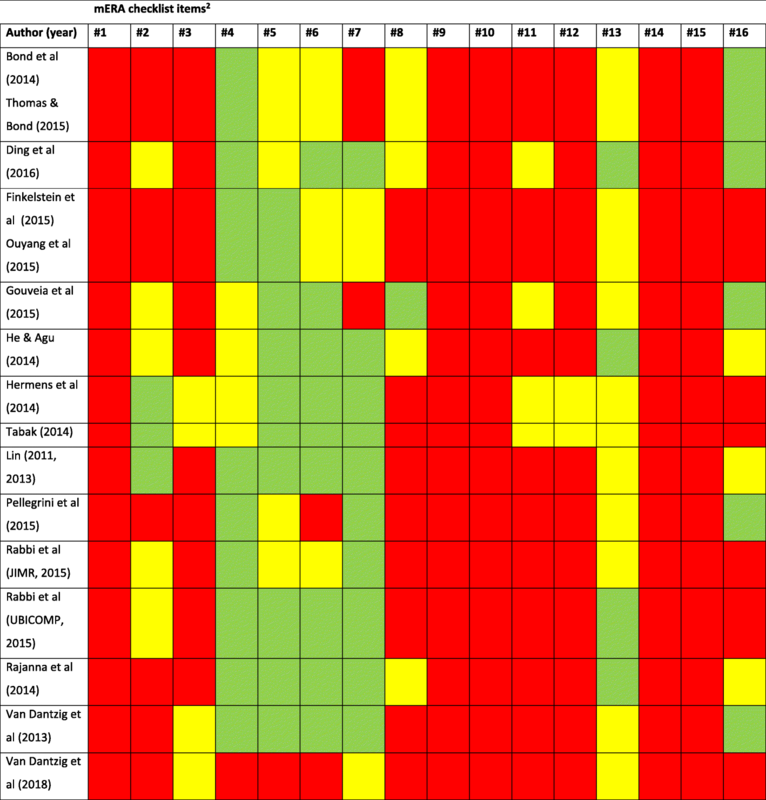 Eight studies were conducted in the US, five in The Netherlands and one in Portugal (Table 1). All except one  were described as feasibility or pilot studies; six studies [28, 29, 30, 31, 32, 33] were randomised (including Van Dantzig 2013, study 2), two quasi-experimental [20, 34] and six studies reported data on feasibility, acceptability etc., but not intervention effects on behaviour (including Van Dantzig 2013, study 1) [26, 27, 33, 35, 36, 37]. Thirteen studies were conducted in the community, including three in universities [25, 31, 36], two in the workplace [29, 33] and one study in secondary care . Sample sizes ranged from 6  to 256 ; the latter study was an outlier as participants were recruited online (the next largest sample size was 86 ). Ten studies recruited convenience samples such as students and colleagues; these studies typically did not report any inclusion criteria. Two studies recruited at-risk groups (overweight) [30, 32] and a further two studies recruited individuals with COPD  and type 2 diabetes . Participants were typically adults aged between 20 and 60 years of mixed gender. Most studies failed to report other participant characteristics; four studies reported education level (which tended to be high) and seven employment status. We discuss a few examples illustrating the distinct features of JITAIs (see Table 2 and Additional file 2: Table S1 for details). Intervention duration ranged from 1 h  to 3 months [20, 35], and was typically 3 to 4 weeks. 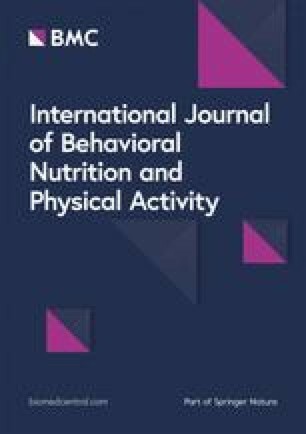 Five JITAIs targeted sedentary behaviour only [30, 32, 33, 34, 37], four physical activity only [20, 26, 27, 29], and five both sedentary behaviour and physical activity [25, 28, 31, 35, 36]. Two JITAIs also targeted calorie intake [25, 28], two provided feedback on number of calories burned [32, 36], and in one JITAI participants could set goals for keeping healthy, losing weight and burning calories . Other intervention components included a face-to-face meeting to explain the use of the smartphone (in some studies participants were given a smartphone) and/or the app, to give participants devices, and explain the rationale for behaviour change (used in six studies [26, 30, 31, 34, 36]), and access to a dedicated or commercial website for physical activity feedback and instructions (used in five studies [20, 25, 28, 32, 33]). Real-time support was triggered when the in-built accelerometer sensed no activity for a specified time and a prompt was sent to take a break from sitting in ten JITAIs [25, 28, 30, 31, 32, 33, 34, 35, 36, 37]. In nine JITAIs [20, 25, 26, 27, 28, 29, 31, 35, 36], real-time support was triggered and activities suggested when opportunistic moments for walking or other activities were sensed. These nine JITAIs used multiple sensors, mostly in-built accelerometers and GPS, but also sensors or apps which used time of day, weather and digital diaries to identify opportunistic moments for engaging in physical activity or continuing current activity. All used apps on Android, with the exception of one study which used IOS and software installed on participants’ computers , and a second study which used a health watch . Five studies [20, 29, 31, 32, 33] used physical activity wearables, smartwatches or activity sensors (wireless activity sensor or computer software measuring keyboard and mouse activity). Four non-randomised studies reported physical activity data. Two used independent accelerometers and reported retention rates of 60% at 3 months  and 89% at one-month follow-up . They found mixed evidence for an intervention effect. In Tabak , 5/10 participants increased objectively measured physical activity between baseline and three-month follow-up, but no participant had maintained increases at 3 months. Pellegrini et al. found a trend for an objective decrease in sedentary time (p = .08), and significant increase in light physical activity (p = .047) between baseline and 1 month. Two interventions resulted in self-reported increases in physical activity within participants. Rabbi et al. found increases in minutes of walking per day (p < .005) over the final three intervention weeks compared to control. In one study , 86% of participants reported at the end of the intervention that they had become a little or much more active. The remaining four studies reported no data on intervention effects on physical activity or sedentary behaviour as they focused on feasibility and acceptability [27, 35, 36, 37]. Our review advances the evidence base about JITAIs for physical activity. We chose to consider both physical activity and sedentary behaviour as they are closely aligned, recognising that others consider them as distinct behaviours. We identified 18 studies of which only three [30, 33, 36] were included in a previous review  which focused on design features and one  in a systematic review of just-in-time feedback . None of our studies was included in recent meta-analyses of mHealth interventions, possibly because most studies were not RCTs and any RCTs were published recently [3, 4, 5]. Prior to this systematic review there was uncertainty about the feasibility, acceptability, effectiveness and cost-effectiveness of JITAIs for physical activity. Our review has provided initial insights on feasibility challenges, illuminated that users found JITAIs acceptable, and found mixed evidence in terms of effectiveness and lack of evidence about cost-effectiveness. However, many evidence gaps remain and our systematic review corroborates earlier reports that research into JITAIs for physical activity is in its early stages . Many JITAIs appeared to be designed without behavioural science input, as they lacked a theory and evidence-base to underpin content.